There have been several claims that stem cells can already be used in patients affected by neurological disorders. What do we really know about these therapies and how should these claims be viewed? There is a great deal of excitement about the possibility of using stem cells to treat currently incurable diseases of the brain - whether these be late onset neurodegenerative disorders like Parkinson’s disease (PD), younger onset inflammatory diseases such as multiple sclerosis or even conditions in which there is an inborn error of metabolism. Whilst this excitement is understandable, it is all too easy for it to spill over into unfounded optimism and with this, the premature translation of therapies to the clinic, where desperate patients and their families will often seek to try any new therapeutic intervention. Replacing cells in the brain: What do we know about stem cell therapies for neurological disorders? all of this can be done without evidence of cell overgrowth or transformation into malignant (cancerous) cells within the transplant. To date the need to achieve all this has only been met in part for neurons derived from embryonic stem cells or iPS cells, and even then the data is not of a quality to merit clinical trials. The problem is that, whilst the cells that can be made in the lab look like the ones needed, they often lack certain vital characteristics. For example cells that look like the dopamine nigral cells needed to treat PD can be made, but they don’t display the proper fibre outgrowth and integration into the host neuronal networks that would be necessary for them to function in a brain. Without this, the cells lack true authenticity and cannot be expected to be able to help patients if transplanted. In the case of other types of stem cells (e.g. mesenchymal stem cells) the evidence that they can form true neurons of the type needed for treatments is even more questionable. It is no longer acceptable to say that cells are neurons because they “look like” them. They need to be shown to not only “look like neurons” but to have all the key properties of neurons and to function as neurons: they must be electrically excitable, release the appropriate neurotransmitter, have all the right genetic markers switched on, make neural structures like processes and synapses and have a functional effect in models of disease. At the moment, extravagant claims are made using cells such as mesenchymal stem cells, based only on very limited characteristics of the cells they produce. And these are claims that will allow for unsubstantiated clinical trials. 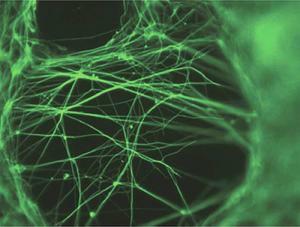 How else might stem cells be used in neurological disorders? Of course stem cells do not only have to be used to make replacement neurons for transplantation. They could be used in other ways, in particular as a supporter of diseased cells and a controlling or adjusting influence within the patient’s central nervous system. Indeed many cite this as a reason why some types of stem cells (e.g.mesenchymal stem cells) may be uniquely helpful in disease. For example, in multiple sclerosis such stem cells transplants may be of value not only in producing substances that support the survival or recovery of damaged neurons, but through reducing inflammation. This may prove a valuable approach irrespective of any ability of such stem cells to turn into replacement neural cells. As such, much work has been done with stem cells of this type in the laboratory but at the present time it remains unproven that they work in any neurological condition.This is not to say that good quality research is not taking place in this area. Indeed, a number of properly funded, well formulated studies have been done in small numbers of patients to show that this approach is feasible and well tolerated. However these careful and thorough trials get lost in the mass of other studies which have appeared on the web (rarely in scientific peer reviewed papers) claiming remarkable benefits from stem cell therapies in a wide variety of disorders (including, but not restricted to neurological disorders). These studies often involve private clinics where the pre-clinical (i.e. laboratory) data supporting the use of their cells is lacking, leading to clinical trials which lack rigour and credibility. "Any experimental therapy has to follow a well established route if it is to be recognised as being of value"
How can safe and effective treatments be developed? The development and translation to the clinic of any experimental therapy has to follow a well established route if it is to be recognised as being of value. First it must be shown in the laboratory that the approach works and HOW it works before it can even be considered for clinical use. If it can be shown pre-clinically to be safe and effective, then it next needs to be tested in a small number of patients in a properly funded phase I clinical trial, where the primary aim is to check that the therapy is well tolerated and safe, though it may be possible to observe some sign of an effect. Patients entering such studies should not have to pay to be a part of the research and it should be funded through appropriate research funds, not public health structures. If such a study shows the therapy to be safe with some suggestion of a possible effect, then a bigger funded phase II study can be undertaken to see if that effect can be better quantified and more information gained on safety. Again this should be properly funded and not rely on patients being able to afford it. Only then can a proper trial be done to see whether the therapy really has benefits over what else is out there for that condition. And then, and only then, can the more definitive studies be planned, the outcome of which will determine if the treatment should become more mainline medical therapy. All of this takes many years and should evolve outside of any funding from patients or national healthcare systems. For many patients waiting for this process to be completed is not a luxury they can afford, as they have the incurable condition for which these therapies are being developed. They are desperate to try anything and it is this vulnerability that is exploited by many clinics around the globe offering unproven stem cells therapies. As a result, many patients are exposing themselves to treatments that have no basis for effect and which also have the potential to kill them. So what is the truth of stem cell therapies for neurological diseases? The truth is that the field is moving forward every year and small, well thought out clinical trials are being planned and undertaken, but to date none have shown a level of effectiveness that gives hope they may be useful as mainline therapies in 2013. With time, progress will be made, but it is only by following the well established methods of translation from the laboratory to the clinic that this can happen. If such approaches are abandoned in the rush to get to clinic, then there is a very real risk that the whole field will be derailed by a disastrous result of an ill thought out treatment. If this were to happen then those therapies being developed using sound scientific principles and which promise to be of a great use in the future, will instead be lost forever as the unproven, commercially driven cells of today confuse and kill the field. Lead image of neuron Copyright 2005 Nicolas P. Rougier, released under the GNU General Public Licence.